Nokia Lumia 925 overview: Lower pixel count, lower IQ? Although not possessing the high megapixel count of the firm’s 808 PureView or newer Lumia 1020 model, the Nokia Lumia 925 achieves a very respectable DxOMark Mobile score of 73 points. That’s just one point behind the Lumia 1020, and four points behind the top-ranking Nokia 808 PureView. Compared to this model’s direct predecessor, the Lumia 920, which scored 66 points and shares some of the camera hardware, the Nokia has made significant strides in a relatively short timeframe. The Lumia 925 also ranks ahead of models such as the Apple iPhone 5 and the Samsung’s Galaxy S3 and Note II models, but can’t quite match either latest Galaxy S4, new iPhone 5S or Sony Xperia Z1, in third and joint second place respectively. With an 8.7-MPix CMOS sensor and 6-element stabilized Zeiss lens, the Nokia Lumia 925 achieved high scores for exposure accuracy across various lighting conditions and for low levels of image artifacts and noise. However, while the lower resolution sensor can’t match the Lumia 1020 for texture (fine detail rendering). It is still very good for a 8-MPix camera, and in fact marginally ahead of the highly ranked iPhone 5S. Overall we found the Lumia 925 has fast and accurate auto-focus and the built-in flash produces pleasing results with good exposure, color and white-balance. However, like any model there were a few downsides: Some instances of color shading and white balance inaccuracies under both outdoor and indoor lighting were observed in our tests, and motion blur can result from overly long exposure times in low-light conditions. We noticed improvements over the Lumia 1020 in video capture, including more efficient autofocus and stabilization in all but our walking tests. The new model has improved color reproduction and detail (texture) preservation, while, at the same, also achieving lower noise levels. Negatives include a tendency for exposure to overshoot during auto-adjustment. And, temporary white balance inaccuracies can result from sudden changes in lighting or with strongly colored subjects. Stabilization during walking wasn’t particularly effective and color fringing was visible on high contrast edges. 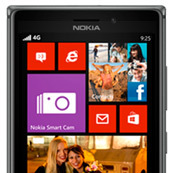 Overall, the Nokia Lumia 925 ranks sixth in Mobile ratings, making it a strong performer, particularly with stills. But, even when used for video capture, coming third overall with a score of 69/100, it’s certainly no slouch. Good overall exposure, even in extreme low light conditions where other camera phones disappoint. Very low noise level with no chroma component. Pleasing photo rendering with flash: good exposure, color, white balance, texture and noise. Fast and precise autofocus when using the push-button to take pictures. Reliable video stabilization in both bright- and- low-light levels. Noticeable color shading with indoor lighting and occasionally outdoors. Low contrast details poorly preserved in low light especially. In low light conditions, overly long exposure times lead to motion blur. Slightly tendency to underexposure outdoors. Occasional white balance inaccuracies outdoors or with fluorescent lightings.